If you have many DivX videos, you may be interested in burning DivX files to DVD video. Burning DivX to DVD will not only let you watch DivX videos on your home DVD player, it will also save space on your hard drive. Then what's the best way to convert DivX video to DVD? Aimersoft DVD Burner is a professional DivX to DVD burner that allows you to burn DivX to DVD with ease. 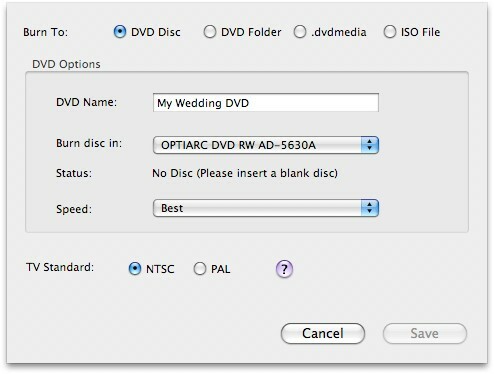 The equivalent version for Mac users is Mac DVD Burner. Free download the DivX to DVD burner and follow the guide below to convert and burn DivX videos to DVD discs. Just make sure you get the right version according to the operating system. Find the target DivX video files and drag them into this program on any Mac running Mac OS X (El Capitan included), or import media files your iPhoto/iMovie/iTunes library directly and quickly with one click. You can edit your DivX videos by cropping the video frame size, trimming to get the part you want, adding watermarks, etc. Some DVD menu templates are provided for you to make your DVD look more professional. Now you may simply click on "Burn" button to burn your DivX files to DVD on Mac. Once the DivX to DVD burning is finished on your Mac, you can watch them on home DVD player or portable DVD players. DivX is both a brand name and a type of codec used to compress video files. DivX Inc., which is formerly known as DivXNetworks Inc., created this codec which they will later sell to Sonic Solutions. Sonic Solutions is a subsidiary of Macrovision, which is now known as Rovi Corporation. There are two kinds of DivX codecs, the MPEG-4 Part 2 and the DivX Plus HD codecs. These codecs are also known as ripping codecs for they are required to transfer audio video elements from a disc and into a computer's hard drive. DivX is a media container for compliant MPEG-4 Part 2 videos and is an extension of the AVI video format. The latest version of DivX codecs is the DivX 8.x. However, the development of the DivX 9.x is already underway. The DivX codecs are compatible with both Windows and Mac computers. The DivX Plus HD format is also the same as the MKV file. Burn Protected WMV to DVD: How to burn DRM protected WMV videos to DVD? Find the most efficient solution right now. Burn MTS with iDVD : This article tells you the best method to import MTS video files to iDVD for burning. iDVD Not Working in Mavericks: iDVD doesn't work in Mavericks? Fix the problem right now. Alcohol 120% Alternative: Looking for a great Alcohol 120% Alternative to burn DVD? Click here to have a look. Alcohol 120% Mac: The article teaches you how to easily and quickly burn DVD with Alcohol 120 on your Mac. Windows DVD Maker for XP: This tutorial shows you the steps for burning DVD disc with Windows DVD Maker on Windows XP. iDVD Lion: Want to know how to freely burn DVD on Lion with iDVD? This article will tell you the answer. Windows DVD Maker No Sound: How to fix the DVD Maker No Sound problem? Click here to find the best solution. ConvertXtoDVD Mac Alternative: This article recommends you the ideal alternative to ConvertXtoDVD for burning DVD on Mac OS X.
Toast for Windows: Wondering how to burn DVD with Toast on Windows? Find the ideal solution here. I just burn many creative DVDs. Very useful tool for me. Thank you for your question. Yes, it supports many popular formats, like MP4, AVI, MOV, etc. Besides DivX files, can I convert other videos to DVD? I used to think that it is difficult to convert find a good tool to convert DIVX files, but I am lucky to find this one. The article is really detailed and helpful. Thank you very much for your effort. I use it to burn many DivX files to DVD for Mac, and now my computer has more free space. Good! With its help, I can watch DivX videos on my DVD player now. I am so happy about that. Hi, our support team will contact you soon to help your solve the problem. Professional DVD burner for Mac to burn videos and photos to DVD on Mac with rich editing features.